One of his passions was for clean-burning propane gas as a fuel. “From 1953, he converted cars to propane,” Tim said. No doubt that had an influence on both Tim’s occupation and pastime. He worked for the liquid propane gas company Amerigas for 40 years, 39 of them in Colfax. “I didn’t have far to travel,” he said. He also had a great love of old cars. In about 1976, Tim was driving through Rancho Cordova when he passed a “beat-up” ’50 Studebaker Champion parked along the road with a for sale sign on it. “I always liked that style with the bullet nose, even as a kid,” he said. So he made a U-turn and checked it out. While it needed some work, it seemed to be basically sound and he made a call to the number on the sign. 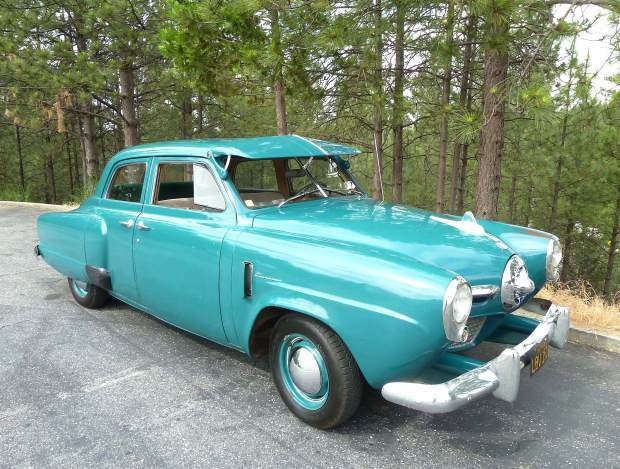 The owner was a member of the Studebaker Drivers Club who had collected a handful of cars. His wife had told him to get rid of some of them. It was still completely stock, which Tim liked, including a 169.9 cubic inch flathead six with a 3-speed manual trans with a column shift and overdrive. It had some extras, like the “hill-holding” clutch that put on the brake when fully depressed to keep from rolling back when stopped on steep inclines and a heater with an extra coil under the rear seat for back-seat passengers. It also had an AM radio and a windshield visor. The price was fair, so he bought it. So Tim had the engine rebuilt first thing. He also had the interior completely redone, seats, headliner and door panels, in period-correct material. “Getting the original upholstery would have cost twice as much,” Tim said. He did change the factory rubber mat to carpet. The car had its original Highland Mist paint in decent condition, except for the right side. It had been sideswiped many years before and been repainted on that side, but is only evident because it’s in better condition. “The rest of the paint is getting a little worn from polishing,” Tim said. However, he gave the paint another rubbing and it came out well. The chrome and glass were all in such good condition they only needed a cleaning. Once Tim had the Studebaker on the road, he took it to car shows as far as Half Moon Bay and drove in Fourth of July parades within a hundred miles from home, where it got many looks and comments from Studebaker fans. He always drove it wherever he took it. The brakes were needing an overhaul, so he jacked it up to do the work. And there it sat for 15 years, on blocks and covered by a tarp. His work schedule eliminated time for his toy. “When I retired,” Tim said, “I told myself that I had to get back on that car.” So in 2015, he did just that. He finished the brake job on all the wheels, went through the entire cooling system, including radiator and all hoses, and changed all fluids on the Studebaker. Then he spruced up the appearance. “I scraped 50 years of grease from the undercarriage,” he recalled. Through the Studebaker Drivers Club, he located a set of reproduction fender skirts. He painted those and the windshield visor, whose paint color had been a little off. “I’m a stocker, so I keep everything as stock as I can,” he said. His Studebaker still has the original suspension, engine, 6-volt generator and tube radio. Even the transparent hood ornament still glows “cherry red” when the lights are turned on. However, he made one major change, which was converting to propane. It was something that Lucky would have done if he had owned the car. You can catch Tim’s Studebaker around town, including occasionally at Cars and Coffee, which happens every Saturday from 8-10 a.m. at the K-mart parking lot off McKnight. It will be burning clean on propane as it cruises down the road. Ron Cherry’s books are available on Kindle and in print copy at Amazon. His new book, “The St. Nicholas Murders,” is a Christmas mystery that takes place in a small town in the Sierra Foothills that is remarkably similar to Nevada City and he will be doing a book signing at Booktown Books in Grass Valley from 6:30-9 p.m. Friday, Dec. 15. Check out his website at http://www.rlcherry.com.